Nope, this is a post about people who have questions. Scratch that. People who are questioning. People who have a question are almost always a joy. They’re inquisitive. They’re typically growing. They love to discover new truths and new insights. People who are always questioning are almost always a drain. They’re rarely satisfied. One question spawns another. Nothing ever gets settled. Those who are always questioning rarely trust leadership…they’re suspicious…they assume every motive is a bad one. Living a non-questioning life sets us apart from unbelievers. We live in a world where people are more known by what they’re against rather than what they’re for. Living a life where we assume the best and trust others isn’t just unusual, it’s almost unheard of. So how about it? Do you have a question? 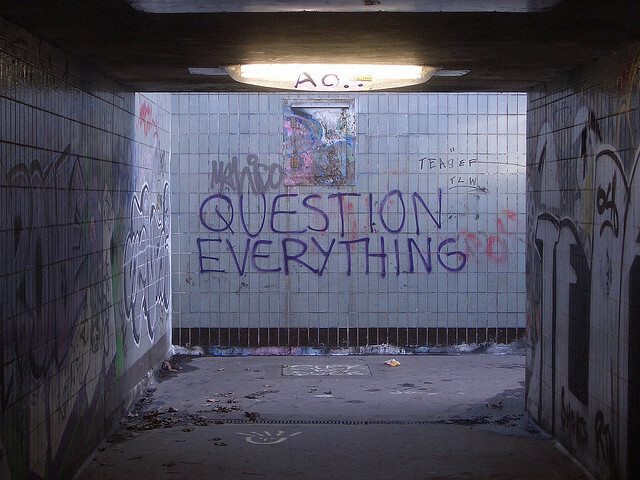 Or are you always questioning? Brother, this was me a few years ago; and old habits die hard. As a constant compla-er…questioner, I can say that those who are doing it just have their defenses up. It doesn’t excuse their behavior, as it cleary displays their distrust of the Lord and His body, but with understanding can come a little extra restraint in applying a violent interpretation of “Bible-thumping.” People of such ilk, left to their own devices, grow old, not older. My name is Cliff and I am a recovering grumbler.